Dogs get stressed…and their bodies have ailments just like ours do! But they do not have a way on their own to relieve the stress or pain caused by everyday activities. Massage is a non‐invasive therapy that benefits the whole body; it circulates and oxygenates the blood and nourishes the muscle. Massage also moves the lymphatic fluids thereby releasing toxins trapped in tight muscles, necessary for relaxation of the muscle. Massage is also vital for preventative maintenance. In keeping the muscles healthy, you thereby improve their chances of reducing injury and improve their general health and well‐being, both physiological & psychological. Check out the Massage page for more specific benefits. Why Do Dogs Need Body Conditioning? All dogs could use a little body conditioning. Whether you have a performance dog, a weekend hiker or frisbee player, a running companion, or a dog that is less active, they will all benefit from a regular strengthening routine. Body Conditioning develops core and trunk strength for improved performance and injury prevention. It can also aide in strengthening certain muscle groups to target specific body areas. Body conditioning also focuses on balance, coordination & gait, weight distribution and areas of over compensation. Body Conditioning is a fitness program that focuses on Strength, Endurance, Balance and Flexibility training. In order to accomplish this, we need to ask the body to expand its exercise plan beyond what it is currently doing. 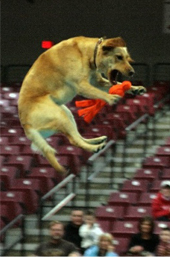 This is accomplished by applying certain cross training techniques. Kathy specializes in canine therapeutic and sports massage, and in canine body conditioning. She has received her massage training from the Rocky Mountain School of Animal Acupressure and Massage in Denver, Colorado; and Equissage in Round Hill, Virginia. She also holds a certification for Equine Massage. She continues to advance her education through various workshops and courses. Kathy receives referrals from veterinarians, sport facilities, animal behaviorists, trainers, boarding/grooming facilities and client referrals. Growing up, she had a passionate interest in animals. She worked with both dogs and horses, from there she developed an interest in canine husbandry.